There is no other fruit with a deeper history than the olive. 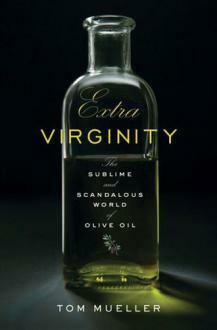 With the publication of Extra Virginity: The Sublime and Scandalous World of Olive Oil, Tom Mueller has taken it to its bitter end and brings it back again. A book filled with twists and turns that would shame the best mystery writer, Mueller tells a riveting tale about an age-old staple. He explores both ends of the spectrum – the dark, devious world of adulterated oil that has plagued the industry for centuries and a new host of characters from chemists to chefs who are trying to take extra virgin olive oil to a higher level. It is a story of two opposites: first-class quality doing battle with worldwide commodity pricing and big-money subsidies. Mueller, best known for his 2007 exposé on the world of adulterated olive oil entitled Slippery Business in The New Yorker magazine, spent the last four years delving deep into the subject. When the stakes are as large as a rapidly growing, $1.5 billion business in the U.S. alone, it’s understandable that Mueller would uncover an undercurrent of shady dealings. He introduces readers to a cast of characters from around the world. From “hero” archetypes like Paolo Pasquali of Villa Campestri in Tuscany, a former philosophy professor, who spearheads a new system to protect oil from tree to table to villainous players like Domenico Ribatti, whose illegal activity eventually led to a plea bargain in Italian court. Even Mark Twain gets a mention. Kudos to the well-deserved acknowledgement of Mike Madison’s long years of diligence as a small-scale producer of first class oil. I was only disappointed that there was so little mention of many other ardent, honest and ethical growers in California who are toiling to see extra virgin olive oil gain its rightful place on the shelf. I hope Mueller gets to meet some of them before he completes a sequel.